by James J. Wheaton, Esq. ; Brian M. Brown, Esq. 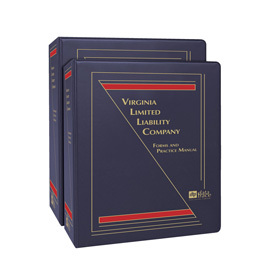 Prominent Virginia attorneys have drawn from their extensive experience to bring you strategies and forms for virtually every situation you may encounter in this newly revised two-volume Manual featuring a bonus CD with more than 185 electronic forms. 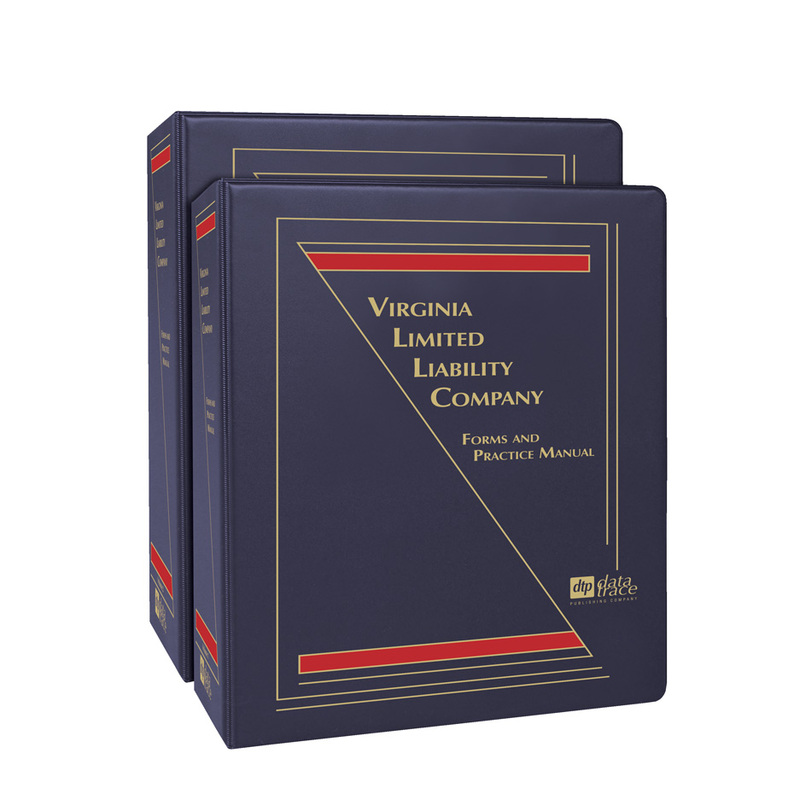 This extensive, updated manual, with its more than 960 pages of valuable content, will help you stay current and efficient by providing appropriate statutes and regulations — complemented by thorough discussions and analyses of any changing federal and Virginia state laws. Plus, you'll be expertly guided through an extensive selection of appropriate LLC forms using an easy-to-follow format. Included are customizable electronic forms as well as explanations and planning strategies for the LLC business structure. James J. Wheaton is General Counsel and Vice President of Legal and Governmental Affairs of Liberty Tax Service in Virginia Beach, Virginia. Previously, he was a partner of the law firm of Troutman Sanders LLP in Virginia Beach, Virginia, where he practiced primarily in areas of corporate and securities law and chaired the firm’s Mergers, Acquisitions and Business Ventures practice group. He is the former chairman of the Limited Liability Companies Committee of the Business Law Section of the Virginia Bar Association and helped draft the Virginia Limited Liability Company Act. He is also past chairman of the Board of Governors of the Business Law Section of the Virginia State Bar and immediate past chair of the Business Law Section Council of the Virginia Bar Association. He served from 2011-2015 as a member of the Council of the American Bar Association’s Section of Business Law, is the immediate past chair of that section’s LLCs, Partnerships and Unincorporated Entities Committee, and was a member of the working groups of that committee that drafted the ABA’s first Prototype Limited Liability Company Act and that recently released a new version of that act. In 2015, he also received that committee's Martin I. Lubaroff award, recognizing his leadership and service in the field of LLCs, partnerships and unincorporated entities law. He has authored various articles and book chapters on limited liability company topics and has participated in limited liability company presentations for the ABA, ALI, ALAS, Virginia CLE, MICPEL, and the Virginia and William & Mary Tax Conferences. Mr. Wheaton received a B.S. from Wake Forest University and a J.D. from the University of Virginia School of Law. Following law school, he clerked for the Honorable J. Dickson Phillips, Jr. of the U.S. Court of Appeals for the Fourth Circuit. Mr. Wheaton has served as a lecturer at the University of Virginia School of Law, teaching a course on business entities. Brian M. Brown is a principal in the law firm of Woods Rogers PLC. Mr. Brown concentrates his practice in unincorporated entities, including partnerships and limited liability companies. Mr. Brown also does substantial work in securities compliance, corporate finance and governance and mergers and acquisitions. Prior to joining Woods Rogers PLC, Mr. Brown practiced with McGuire Woods LLP. He has represented many Fortune 500 companies in all aspects of corporate governance and securities compliance. Mr. Brown has extensive experience dealing with and advising clients regarding the impact of the Sarbanes-Oxley Act of 2002. Throughout Mr. Brown’s career, he has represented many real estate investment trusts, technology companies, furniture manufacturers, insurance companies and electronics distributors. He has represented a sizeable portfolio of clients, ranging from large multi-billion dollar international companies to start-up entities and has been involved in and facilitated the raising of billions of dollars in equity and convertible securities. Mr. Brown is also a contributing author of Virginia Partnerships, (2002). Mr. Brown regularly lectures for Lorman Educational Services on partnerships and limited liability companies. Mr. Brown received his B.A. from the University of Michigan and his J.D. from Michigan State University College of Law.